It takes a whole community to help individuals living with medical conditions to lead healthier, happier lives. The more data we collect about an illness, the closer we come to helping communities find treatments that work. Once registered, view collected data and learn from others. Your contact information is never shared. You are the expert of your own health. By providing your medical information, you give researchers a new perspective on disease. Anyone with FCS can contribute data anonymously, and anyone who needs the data can access it. We’re making information as useful, comprehensive and safe as it can possibly be. Registration takes just 10-15 minutes. The data you provide lasts a lifetime. 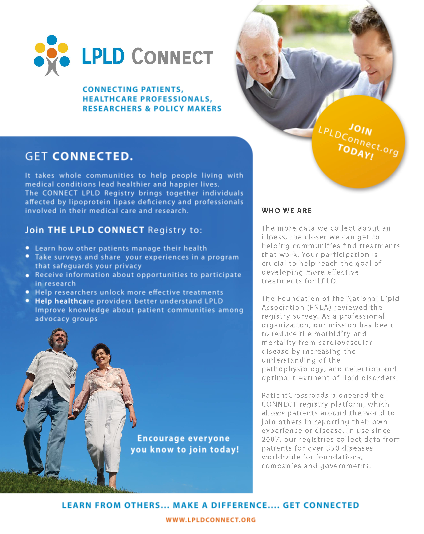 Spread the word, download the LPLD Connect flyer and link to the registry! Severe hypertriglyceridemia (severe high triglycerides) is seen in conditions such as familial hypertriglyceridemia, chylomicronemia syndrome, LPLD and others. In this rare disorder, the level of triglycerides (a type of fat) in a person's blood are higher than normal. The condition is not associated with a significant increase in cholesterol levels. If you have been diagnosed with severe high triglycerides, please register and complete a medical questionnaire to help researchers discover treatments.